This second installment of the series is on the costume of the Ladin people. This is not to be confused with Ladino, which is a language used by Sepharidic Jews. both terms are obviously derived from the word Latin, and both are Romance languages, but other than that there is no connection. Ladin is spoken in five valleys which radiate from a common center like a star. 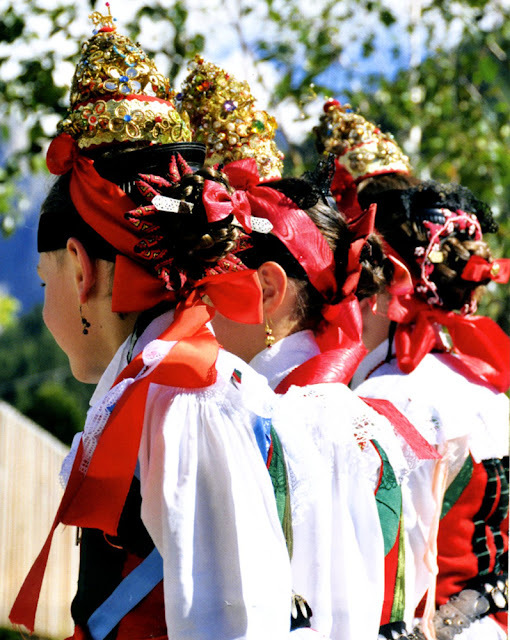 As so often happens to mountain people, these valleys find themselves in three separate provinces of Italy. Here is a map showing their location, and the names of the valleys in the Ladin language. 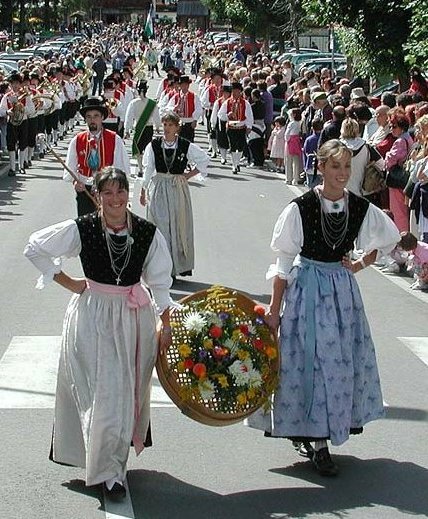 The two northern valleys are in South Tyrol, The third is in the Province of Trentino, and the other two are in the Province of Belluno. The language is found further afield to some extent, but the overwhelming majority of the people in these five valleys still speak Ladin. Two more maps to show you more detail of the area, how the valleys run and the names of the local communities. 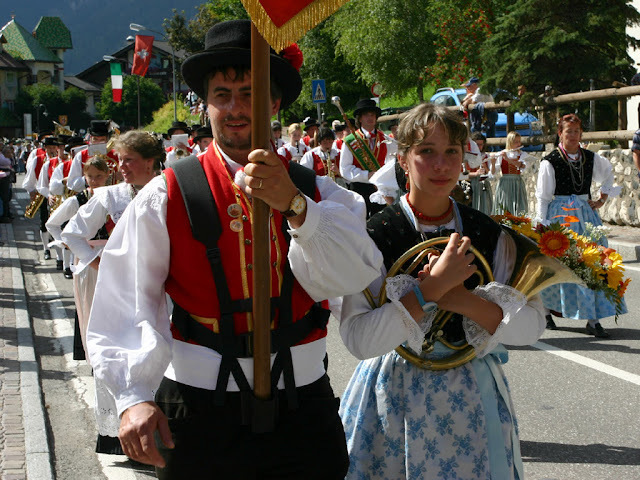 Untill the end of WWI, both South Tyrol and Trentino were part of Austria, while Belluno was already part of Italy. 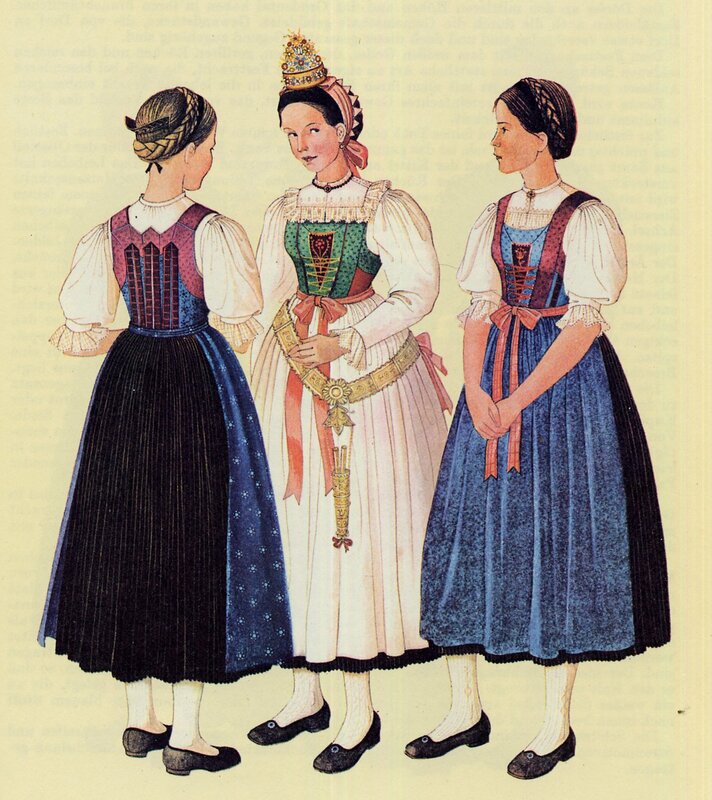 This is reflected in the costumes. 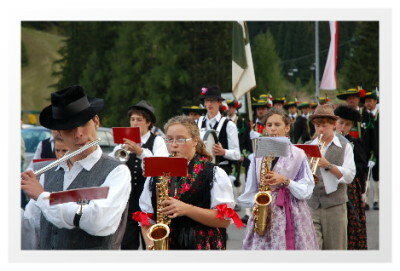 The photo at the top of this article is of young people from this valley. This valley forms part of South Tyrol. 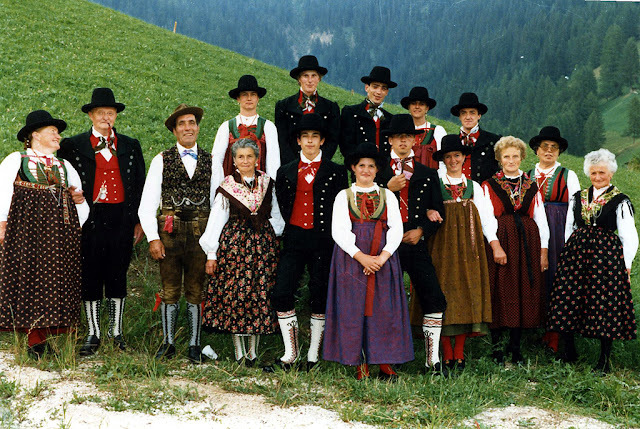 In spite of its being currently part of Italy, the overwhelming majority of people in South Tyrol speak German, and consider themselves to be Austrian. 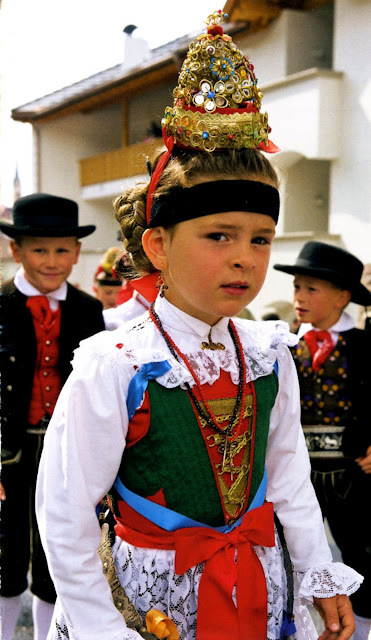 The Gherdeina costume is very similar to the costumes worn in the rest of South Tyrol, with some additions. It is generally considered to be the richest and most elaborate costume system in the area. 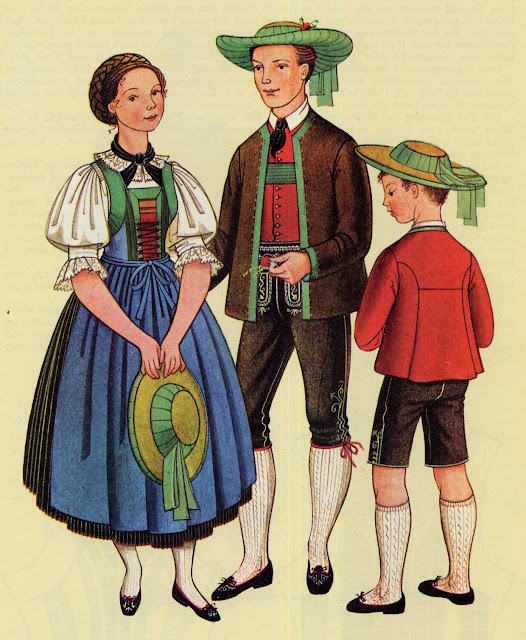 The young man is wearing an outfit which is immediately recognizeable as being Tyrolean. 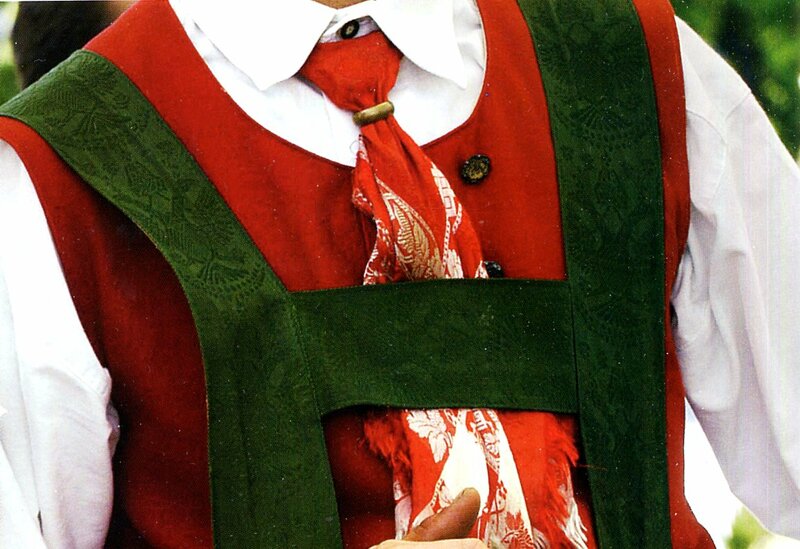 Leather knickers, wide hat, red vest, suspenders sewn of green ribbon, kerchief around the neck. 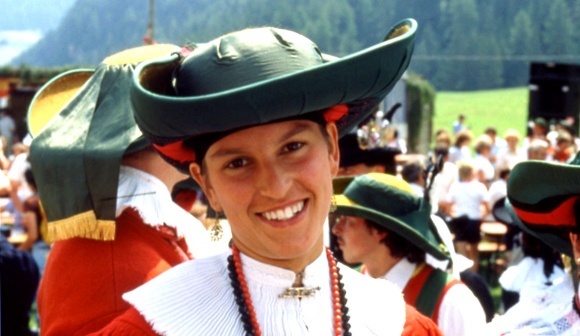 The major difference between the mens' costumes around Tyrol is in the shape of the hat. 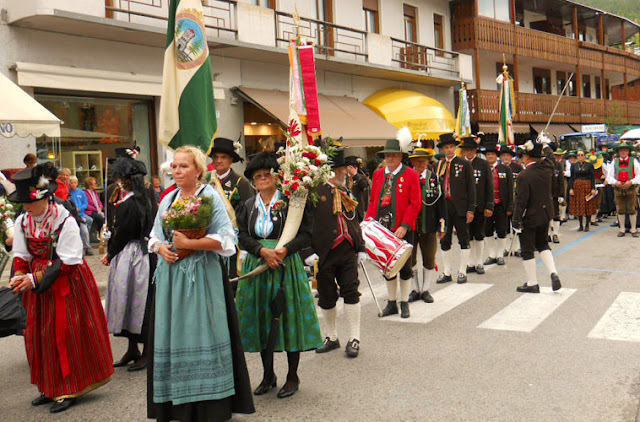 If one looks closely at the design woven into the green brocade ribbons which are ubiquitous in the costumes of South Tyrol, you will see the Austrian double-headed eagle woven into the design. This costume exists in several versions, proof that it is a living tradition. 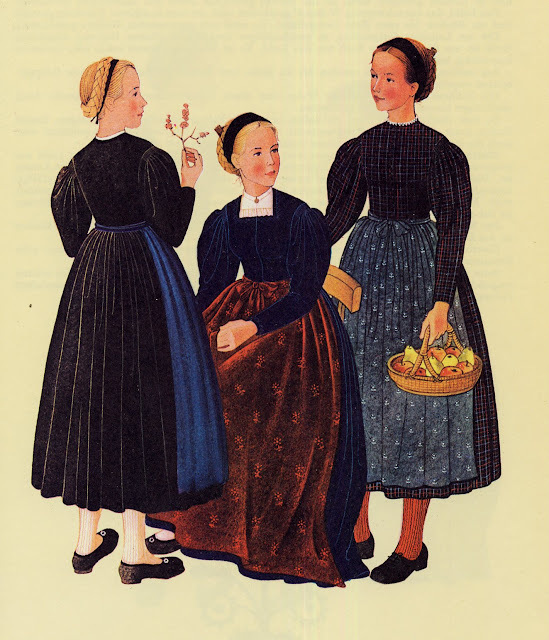 The most famous is the festive costume for unmarried girls. 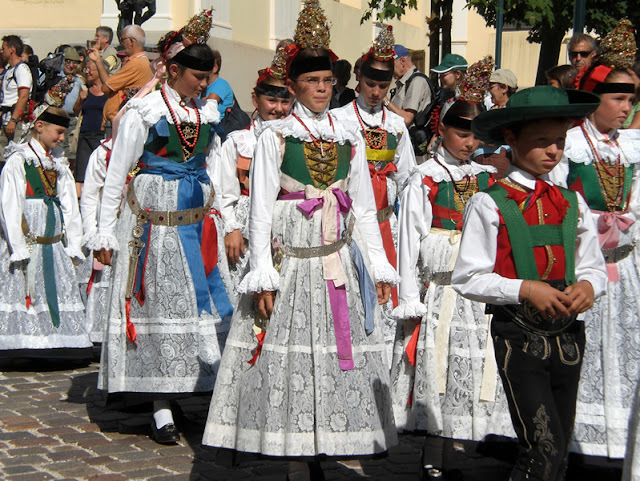 This includes the typical Tyrolean blouse, laced up bodice with plastron, full skirt, which are all typical of Tyrolean costume, as is the Goller, a separate coller with white embroidery and lace, which sits across the shoulders and is tied under the arms with ribbon, as you can see in this photo above. The metal belt, reminiscent of the ones worn in Slovenia are also worn by older women, but the full lace apron and the headdress are only worn by unmarried girls. 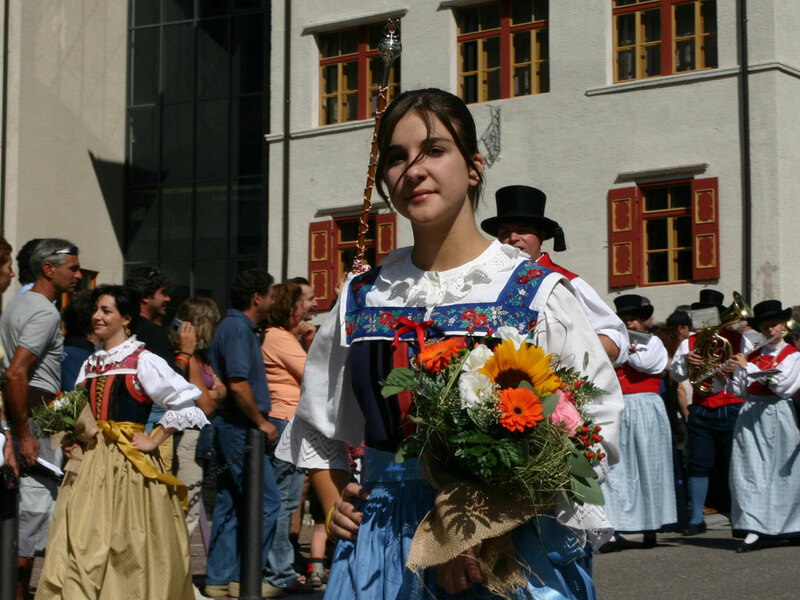 Called in the local Ladin dialect a ghërlanda spiza, it is a light-weight dome-shaped crown. 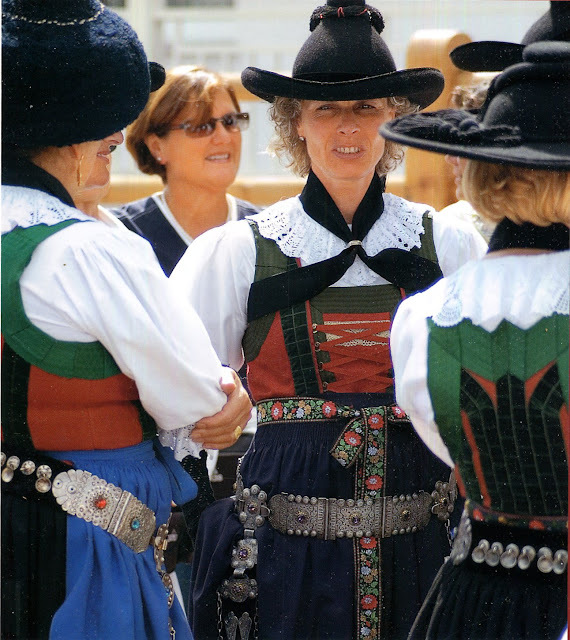 The belt traditionally has a pocket which holds a knife and fork, a remnant of the middle ages when tableware was expensive, and if you were a guest in someone's home you were expected to bring your own. [This is also true of the Scottish Dirk, which is worn to formal occasions, but in the dirk, the utensils have shrunk to unusable dimensions]. 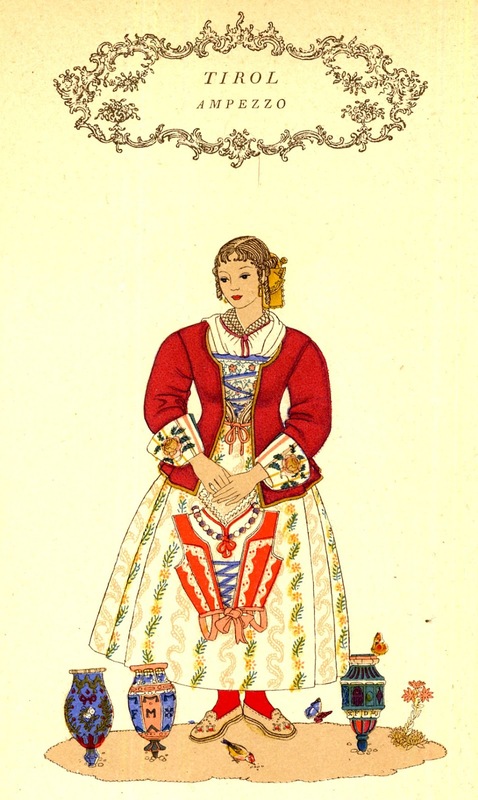 Here is Emma Calderini's plate of this costume. 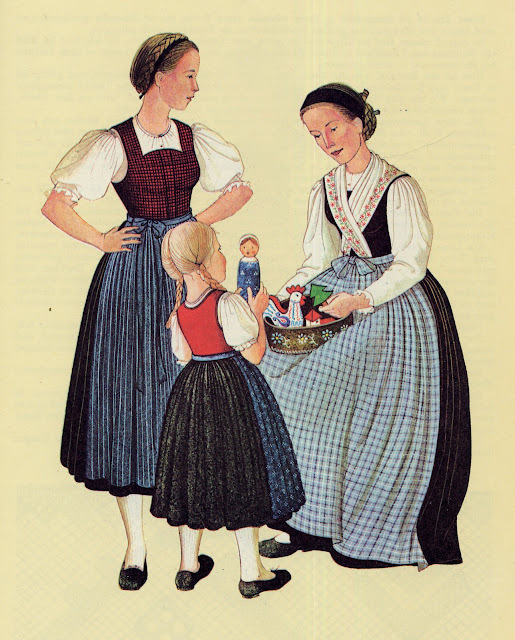 It is illustrated both in Austrian and in Italian books. 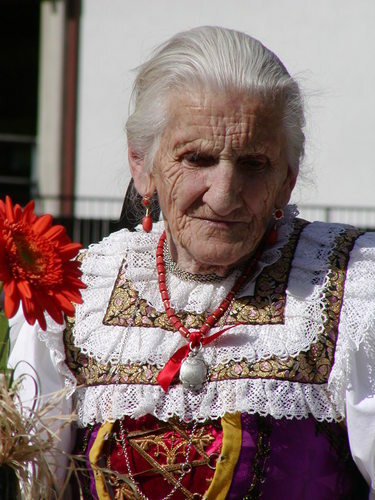 The costume worn by married and older women is also attractive, and still highly ornamented. 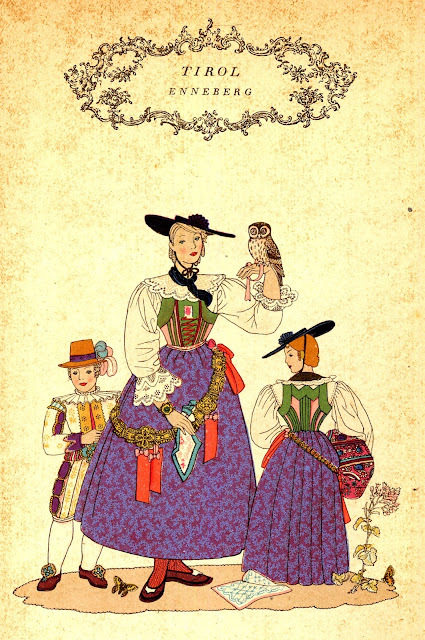 Notice that the same blouse can be worn down, or can be pushed back past the elbow. 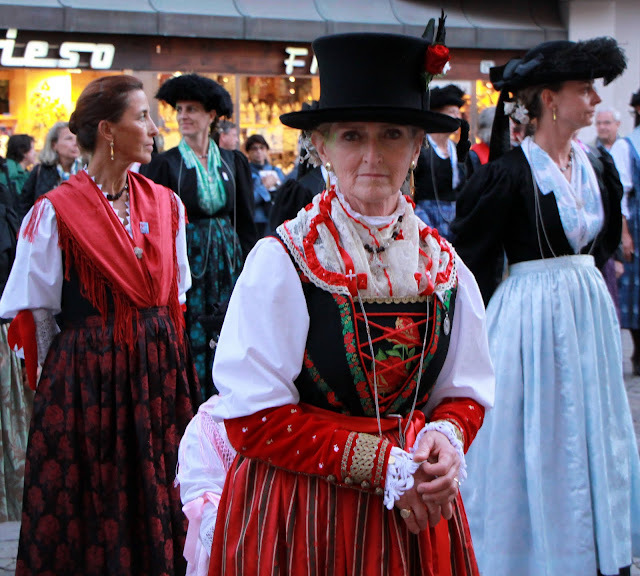 These above are costumes for festivals. 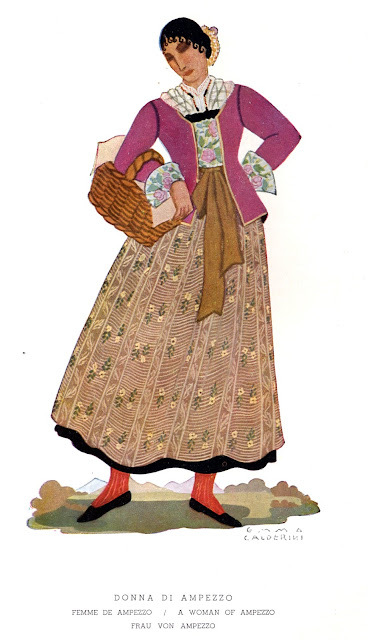 there are also other versions of the costume for less dressy occasions. 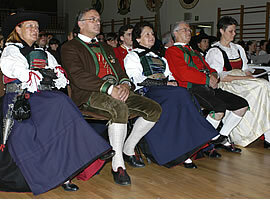 Older and married men often do not wear the red vest. This couple is from the town of Ciastel, [Castelrotto in Italian, Kastelruth in German], which is lower in the valley. The winter version seem quite cozy. 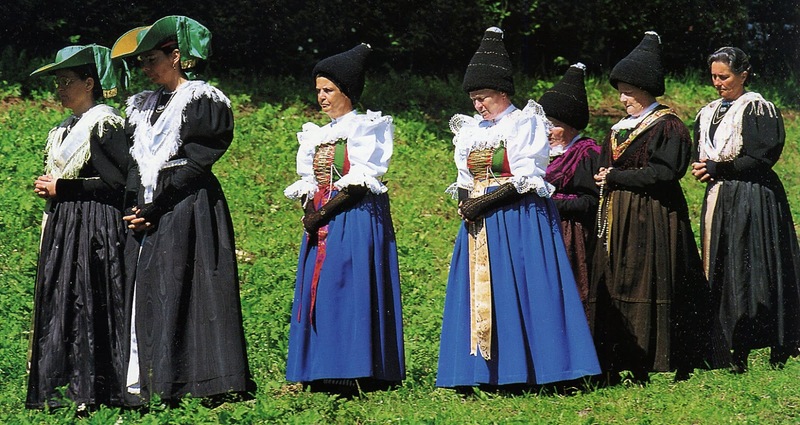 I cannot figure out how the cone-shaped hat is made. The everyday costume is a very practical dirndle type outfit. 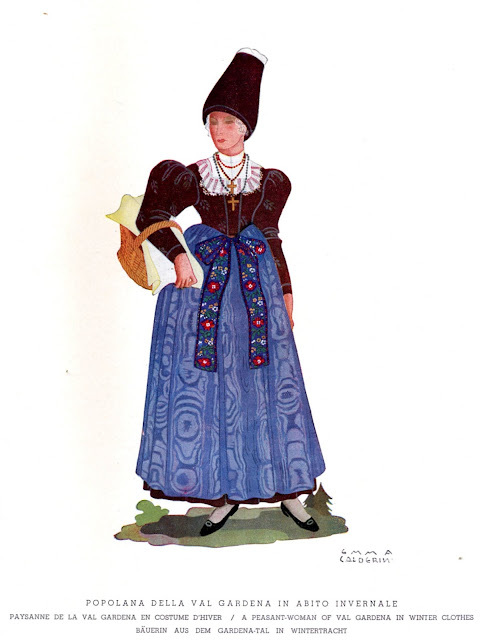 Many people have illustrated this costume. 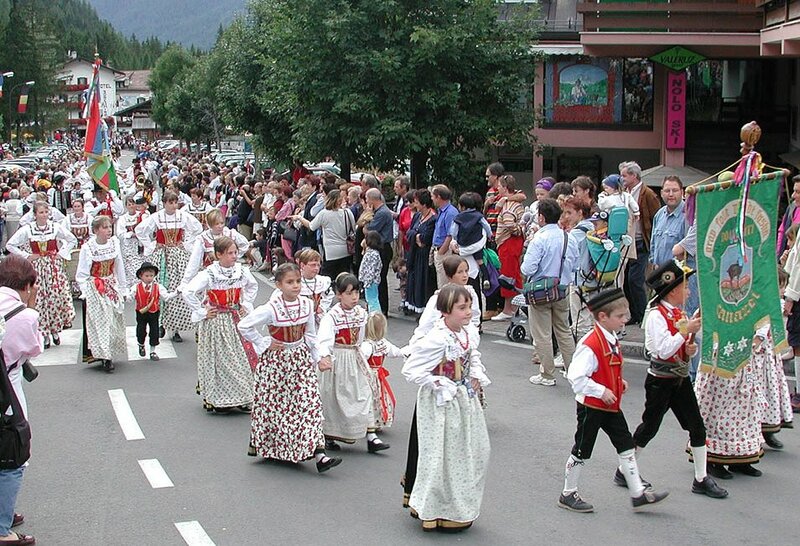 And so we say goodbye to Val Gherdeina. 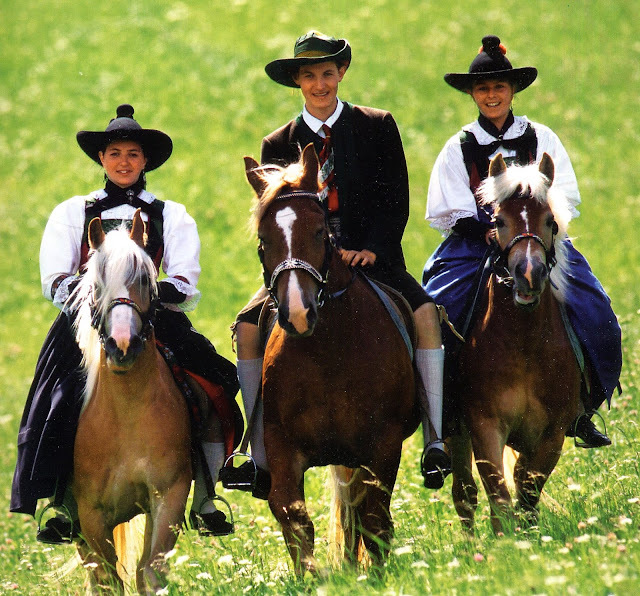 This valley is also part of South Tyrol, it is a side valley of the Pustertal. 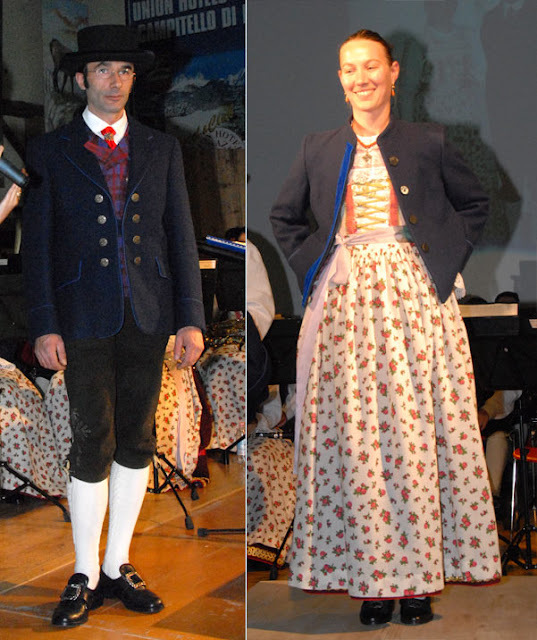 The costume is also typically Tyrolean, and similar to that of Val Gherdeina. 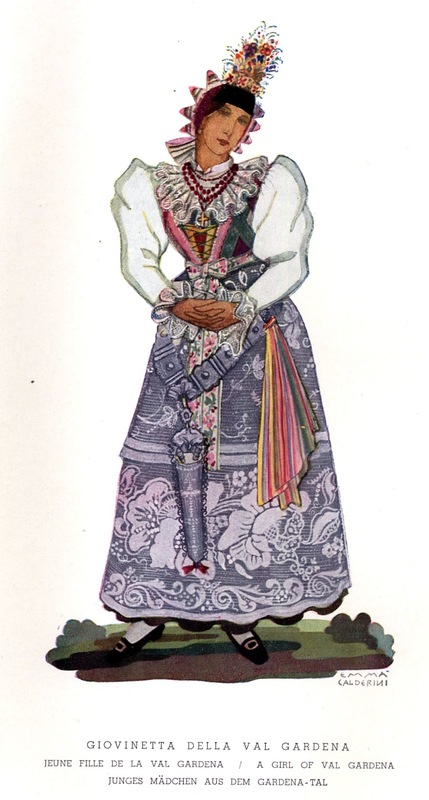 I have not been able to find as many images of this costume. 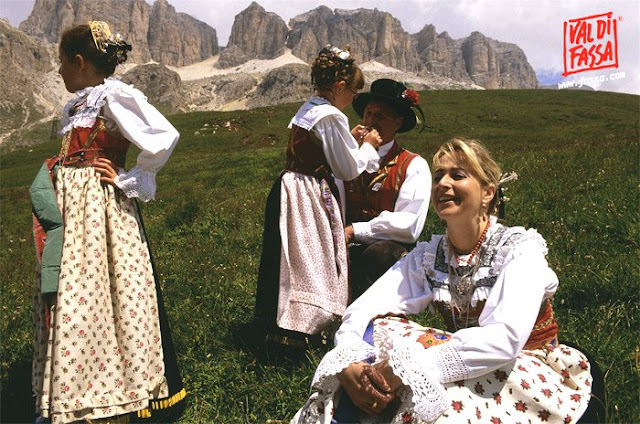 This valley is in the northeast corner of the province of Trentino. Although this province was formerly part of Austria, the majority of the population speaks Italian [Lombard in the west, Venetian in the east]. 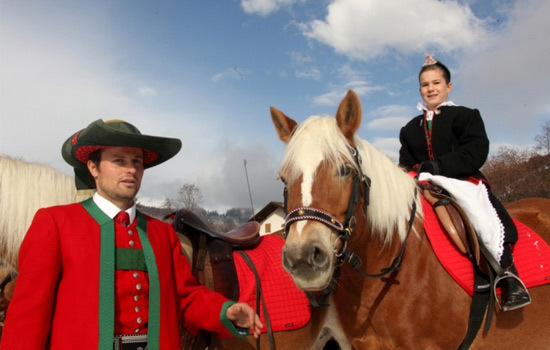 This costume, while still Alpine, has a less Austrian look. 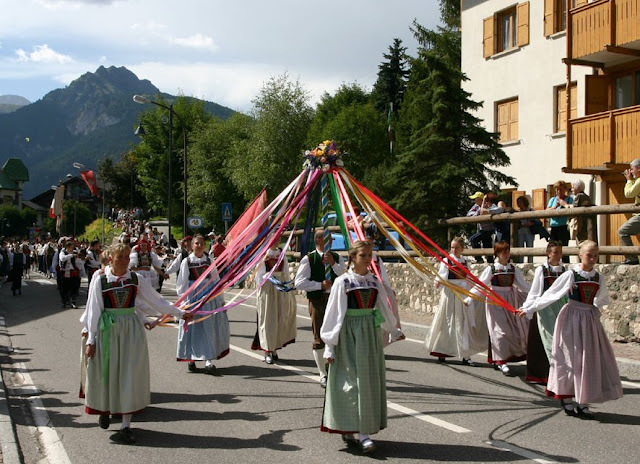 This and the last valley are in the northwest of the Italian province of Belluno. 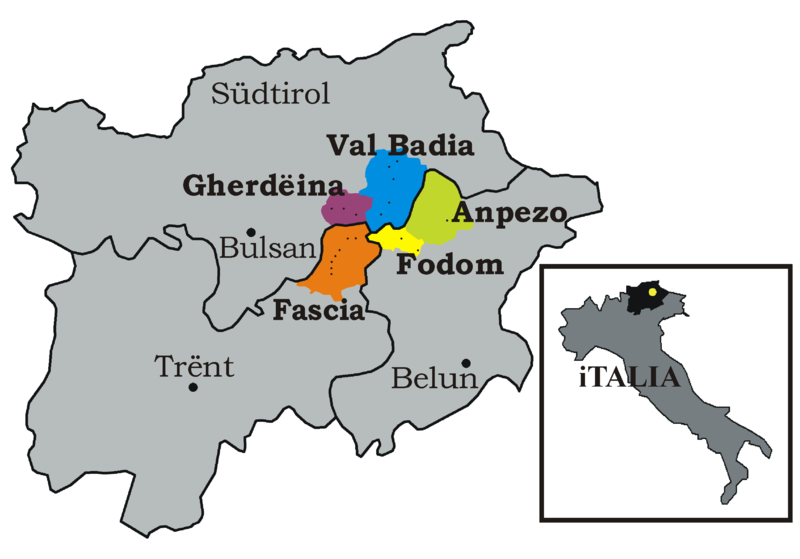 There are some Ladin speakers found outside of these valleys, especially in the north of this province, but most people speak Italian [Venetian]. 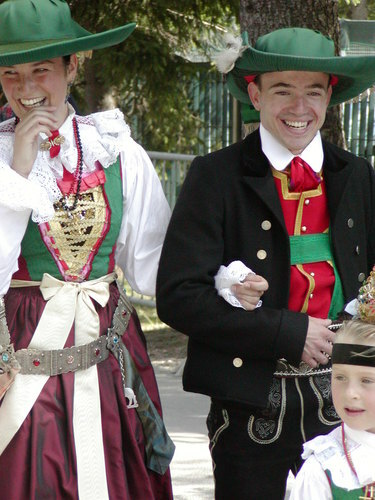 These costumes have a more Italian look to them. 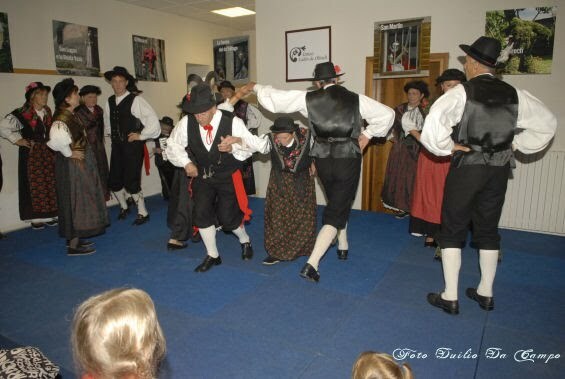 The local dance group gives performances up and down the valley. 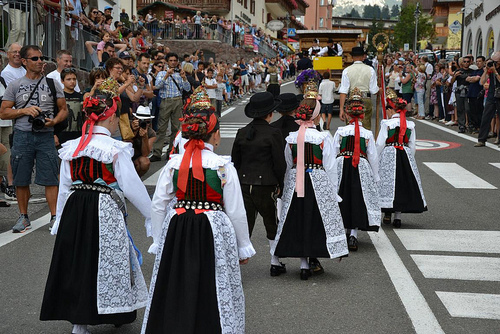 This photograph is described as showing the costumes of the Ladins in Belluno Province, both valleys. 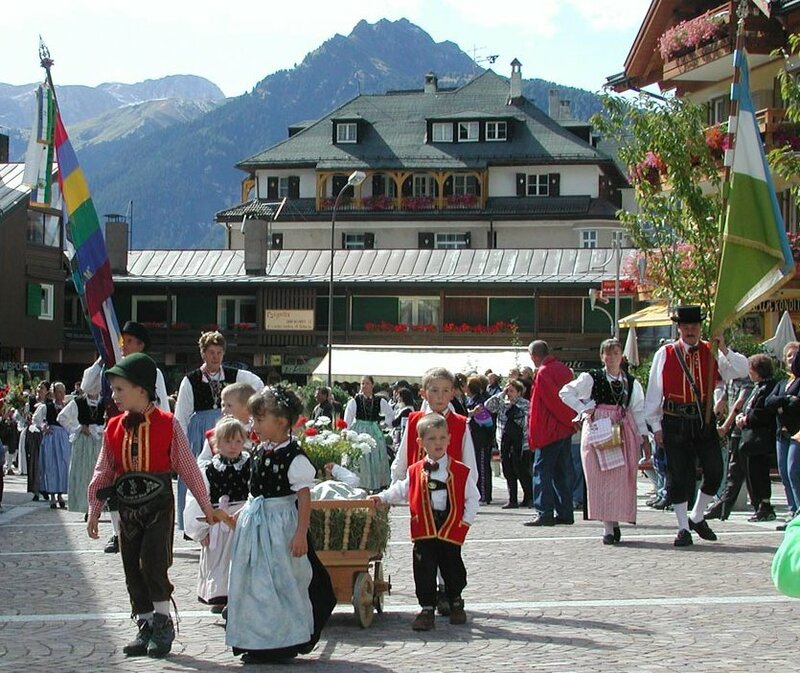 In Italian Cortina d’Ampezzo in German Hayden [These refer to the main city]. 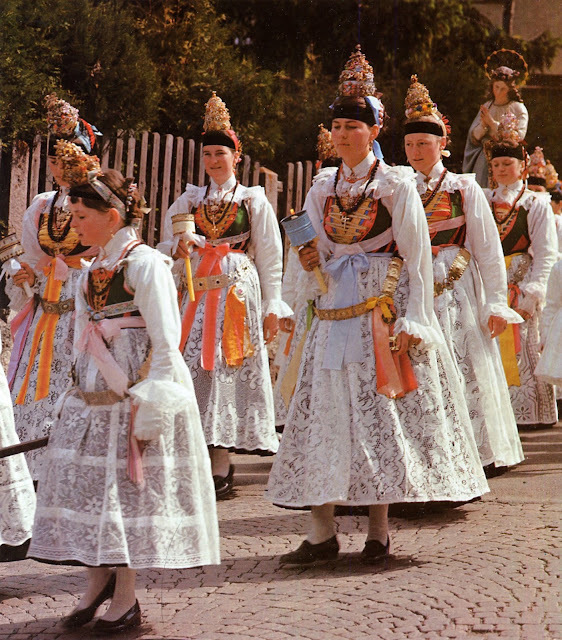 I have only found a few images of the costume from this valley. 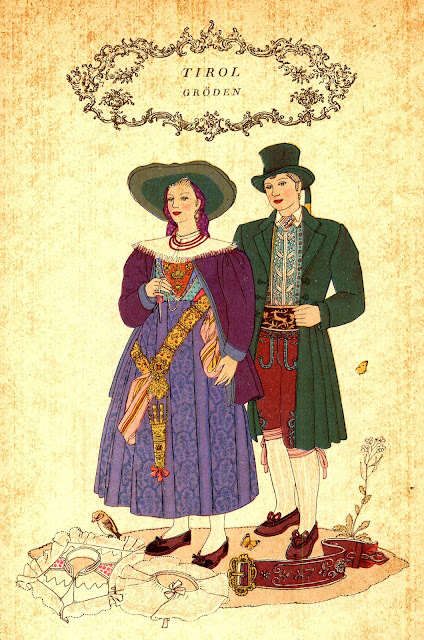 The modern photos which I have found seem to show a different costume, I am lacking any more information, but here they are. 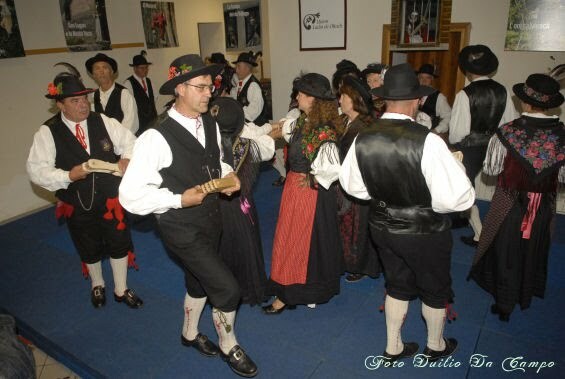 If anyone knows more about the costumes of this area, please let me know. 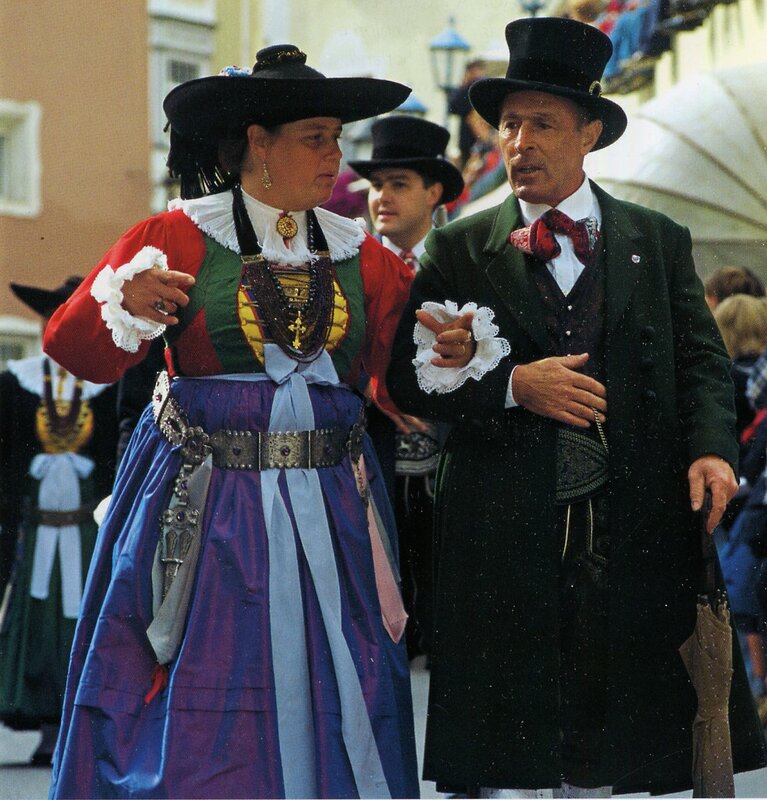 There seems to be some similarity to the Italian costumes found not far to the south. It is frustrating that sometimes there seems to be very little material available. 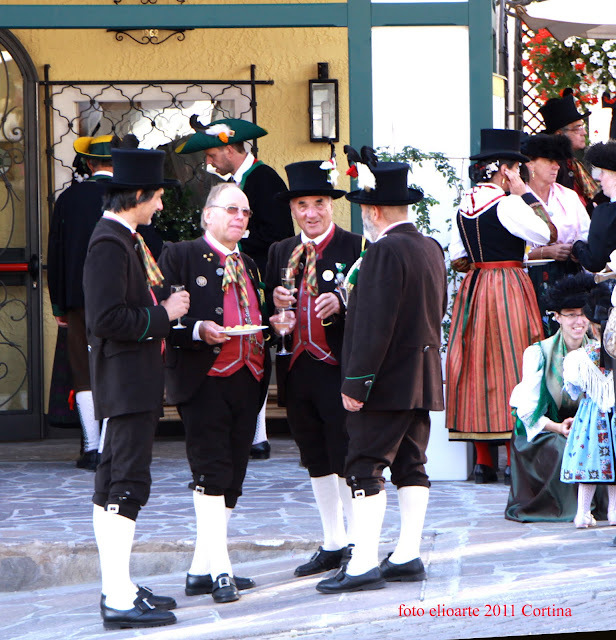 There is also an Ampezzo in the Friuli territory, but these do not resemble Friuli costumes. 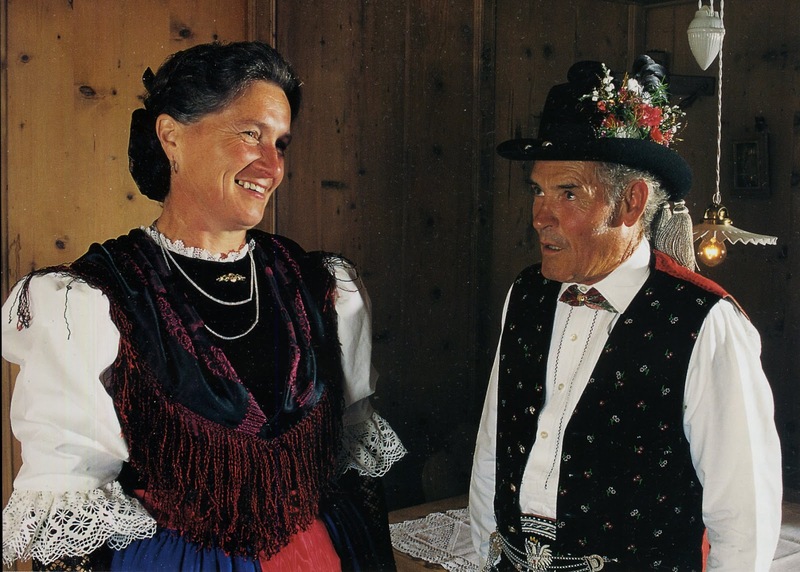 For those who are interested in languages, here are a couple of Ladin men singing. 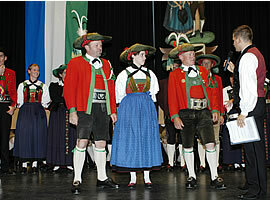 They are in costume, but also the text of the song is given in Ladin. 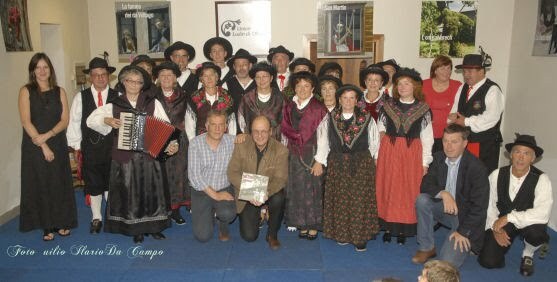 Thank you for reading, I hope that you have found this interesting. If anyone has more information on this subject, please let me know.